3M™ Dual Lock™. Reclosable fastener where stems with “mushroom” heads interlock when pressed together. Can be opened/closed more than 1,000 times. Generic use, suitable on almost all surfaces. 38 stems per cm². Stem colour: black. 3M™ Dual Lock™. Reclosable fastener where stems with “mushroom” heads interlock when pressed together. Can be opened/closed more than 1,000 times. Generic use, suitable on almost all surfaces. 62 stems per cm². Stem colour: black. 3M™ Dual Lock™. Reclosable fastener where stems with “mushroom” heads interlock when pressed together. Can be opened/closed more than 1,000 times. Excellent resistance to UV and plasticisers. 38 stems per cm². Stem colour: clear. 3M™ Dual Lock™. Reclosable fastener where stems with “mushroom” heads interlock when pressed together. Can be opened/closed more than 1,000 times. Low thickness. 38 stems per cm². Stem colour: clear. 3M™. Single-sided tape for general use in closing cardboard packaging. Good resistance to tearing, abrasion and humidity and makes an excellent against dust and contaminating agents. Guarantees excellent adhesion to corrugated cardboard. 3M™. One-sided adhesive masking tape, extra wide. For excellent masking results with two-component and water-based paints. Excellent resistance to solvents. 3M™. Single-sided semi-crepe paper tape (masking tape), high conformability. Suitable for polymerisation cycles and infra-red/UV heating. Instant adhesion, excellent resistance to solvents. Designed for internal use only. Single-sided tape, high resistance to moisture, chemical agents and solvents, good mechanical resistance, excellent ageing resistance. Single-sided smooth aluminium tape (thickness 30 my). High adhesion, resistance to UV rays, high thermal conductivity and good resistance to temperature. "Covering air-conditioning pipes • Lamination expanded material "
Single-sided smooth aluminium tape (thickness 60my). High adhesion, resistance to UV rays, high thermal conductivity and good resistance to temperature. 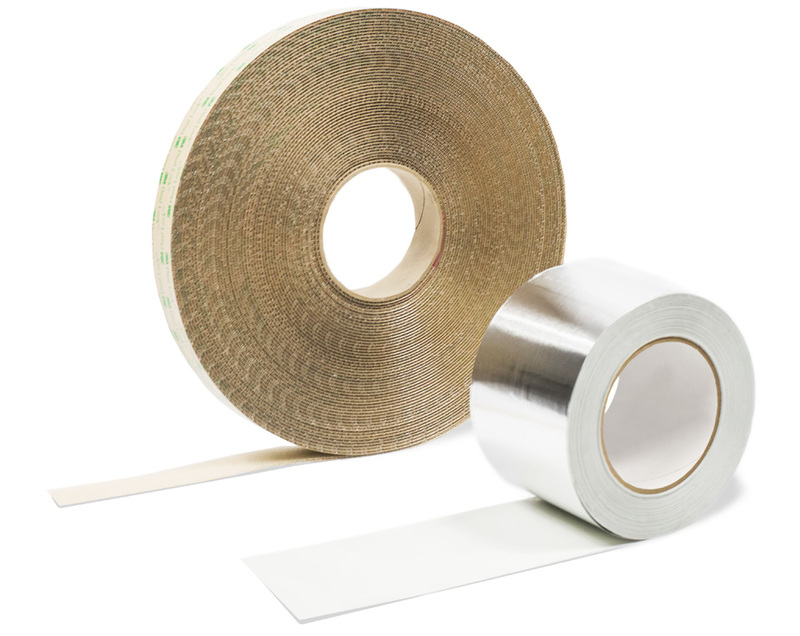 Single-sided aluminium-polyester laminated tape, with no protective liner. Excellent resistance to lengthways and sideways traction. High adhesion, resistance to UV rays, high thermal conductivity and good resistance to temperature. Permanent single-sided tape, resistant to high temperatures, trace-free removal, resistant to traction and attack by corrosive agents, insulation class B/130 UL. Single-sided semi-crepe paper tape. Developed specifically for masking in the building and automotive industries. Single-sided packaging tape, noiseless unwinding. Single-sided packaging tape, noisy unwinding. High adhesion, excellent temperature resistance. Single-sided packaging tape, noisy unwinding. High adhesion, used mainly on automatic taping machines. Single-sided packaging tape, noisy unwinding. Excellent temperature resistance and shear strength. Does not leave traces thanks to its special adhesive formula. Permanent single-sided tape in spools for easy opening. High shear strength. Permanent single-sided tape, resistant to high temperatures, trace-free removal, resistant to traction and attack by corrosive agents, insulation class B/130 UL. The laminated liner makes it easier to punch. Single-side embossed aluminium tape. High bonding, resistant to UV rays, conformable, high thermal conductivity, good resistance to temperatures. Specifically for insulation.